Milestones From 13 stations in 1935 to 182 in 2011, Metro also attracts thousands as an underground museum; plans to add another 120 km track by 2020. The Moscow Metro breathes history; in this transit place, you will find Lenin cruising with Tolstoy, Pushkin and countless common Russians. Lying at a depth of 5 (Pechatniki station) to 80 metres (Park Pobedy station), the history of the last eight decades unfold before your eyes, carved out of marble and granite and built in iron and glass – revealing the tastes, ideas, dreams, hopes and disappointments of the previous generations and contemporaries. The Moscow Metro dates back to 1931, when its construction first began, although engineers Pyotr Balinsky and Evgeny Knorre submitted their first designs to the Moscow City Duma as far back as 1902. “His speeches carried a strong temptation: like a true demon, he would promise to cast Moscow down to the bottom of the sea and raise it above the clouds”, a journalist for the Russkoye Slovo newspaper commented on Balinsky’s idea. Yet the Duma, made up of rich people, did not bite the bait: after all, they all lived in the centre of the city and never rode overcrowded trams. After five failed proposals before the Duma, the Moscow Metro finally threw open its doors on May 15, 1935, 18 years after the revolution, and carried the first passengers on its moving staircases, escalators, and the padded seats of its new wagons (unlike the wooden seats in trams). The first metro line – from Sokolniki to Dvorets Sovetov (now known as Kropotkinskaya) -- was 11 km long and had 13 stations. Now, the Moscow Metro has a track of over 300 km with 12 lines and 182 stations. The city’s development outline for 2020 envisages that, by then, another 120 km will have been added to the existing routes. For the first 20 years of its history, the Moscow Metro was named after Lazar Kaganovich, the “iron commissar” and Stalin’s right hand man, who was in-charge of construction of the first stage of the metro (incidentally, he personally blew up the Cathedral of Christ the Saviour in December 1931 as a part of the Proletarian Capital project). In 1955, however, the Metro was renamed after Vladimir Lenin. Although Russia has long since changed its political track, you can still find the images of the former leader at over 10 stations, including, for instance, busts of Lenin at Belorusskaya and Komsomolskaya stations, impressive mosaics at Baumanskaya and Kievskaya stations, a tile panel in the passage between the Borovitskaya and Biblioteka Imeni Lenina stations. By a bitter irony of fate, Lenin’s full-face and side-face images decorate the Tsaritsyno (translated as the Tsarina’s Estate) station (dubbed Lenino up until 1990) – images of the very person who ordered the shooting of the royal family. You will not, however, find any images of Stalin in Moscow’s underground. A symbol of Russia's victory, he was omnipresent in the late 1940s. After his death in 1953 and the denunciation of Stalin’s personality cult, his images were gradually withdrawn from the Moscow Metro. 1955 heralded the end of the good times for Russian architecture – both underground and above ground – after the Communist Party issued a decree "On elimination of extravagance in design and construction.” Dull stations, without any stucco work, mosaics, original columns or other “unjustified” elements, were built under the slogan “Kilometres at the expense of architecture”. Things were the same above the ground, where entire cities were built of commonplace five-storey apartment blocks, all looking the same, nicknamed ‘Khrushchevkas’ after the then leader, Nikita Khrushchev. To get a sense of this period’s architecture, see the few stations built in the 1960s-1980s like Tverskaya, Kitay-Gorod and Kolomenskaya. In 2002, with the reconstruction of the Vorobyovy Gory station, the development of the Moscow Metro entered a third stage, which could be defined as ‘renaissance’. The platform of the station offers a splendid view of the Moskva River, the Luzhniki Olympic Complex and the Academy of Sciences building. Architectural canons of the 1930s-1940s were once again in use in the design of underground stations. 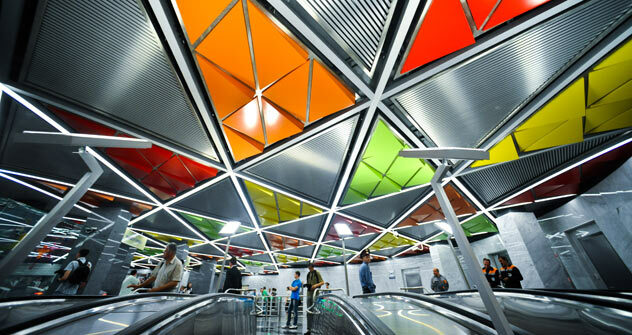 By the same token, artists once again become involved in decorating the stations. As such, the Sretensky Bulvar station boasts silhouettes of Pushkin, Gogol, and Timiryazev and Moscow sights; the Dostoevskaya station is decorated with black-and-white panels featuring the main characters from Dostoyevsky’s novels The Idiot, Demons, Crime and Punishment, The Brothers Karamazov, and the Maryina Roshcha station flaunts its pastoral mosaic landscapes.